Rules’s long history has turned it into an infamous venue in the West End. Writers, artists, lawyers and journalists amongst a multitude of other professions have enjoyed the traditional British food served for decades. 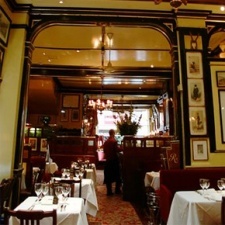 The combination of historic charm and central Theatre-land location ensure that the restaurant continues to lure Londoners and tourists alike. Tom's Kitchen at Somerset House mirrors the Chelsea outpost but brings to the table an air of exclusivity thanks to the impressive setting. Is it worthy of the hype? I'd say so; a night here tends to go without a hix. The produce, the techniques, the expertise and the heritage is enough to get the mouth-watering. Now show us what you've got Jamie!